1044 Edward the Confessor granted the town of St Edmund its own mint. 1066 By this time, there were about 70 mints active in England. Since the time of King Eadgar in 973 the name of the mint had to be put on the coins. King William the Conqueror allowed all 70 existing mints to continue working after the Conquest. Following the Anglo-Saxon tradition, the silver penny was still the only coin struck, but at the time it was fairly valuable. When smaller units were needed, pennies were cut into halves or quarters quite legally by merchants and traders. These coins were always worth their face value in silver and so it was the legal responsibility of individual moneyers to ensure that this was upheld. The dies for coins were all made in London under the King's supervision, then sent out to the provincial mints where coins were struck. Each moneyer had his own dies made for him, containing his name and town, but perhaps because they were made centrally, the spelling was often strange and inconsistent. To ensure that each moneyer could be traced, his name was included after a small cross, followed by ON (meaning OF) and the town name as listed above. This was on the reverse or "tails" side, with a bust of the King on the "heads" side. The moneyer's name was thought to be more important than his town and so if his name was long, the town was greatly abbreviated. 1100 Henry I continued to mint silver pennies, although in 1108 he made provision for round half pennies to be made, but only one has been found. It was otherwise customary, and also accepted practice, for pennies to be cut in half to make halfpennies, and into four to make farthings. 1112 The standard of coins and their silver began to deteriorate and counterfeits were rife. The public did not want to accept clipped coins so in 1112 all new coins were snicked officially to ensure the acceptability of all coinage. 1124 Henry I became so enraged by the state of the coinage that he held the "Assize of the Moneyers" at Winchester when all the moneyers of England were called to account for their activities. Some, or all the them, were mutilated for issuing coins of inferior quality. So grave was the debasement of coinage that the standard punishment was said to be loss of the right hand and right testicle. 1135 Stephen of Blois claimed the throne and was king until 1154. 1137 Matilda provoked a civil war when she claimed the throne based in Bristol. Many Barons struck coins and some East Anglian coins show Stephen's head defaced. Mints producing coins for Matilda were, however, mainly in the West Country. 1150 By this time the 70 mints from before the Conquest had dwindled to about 55. 1154 Henry II's reign lasted from 1154 to 1189, and he reduced the mints down to 30 in order to issue a uniform coinage. 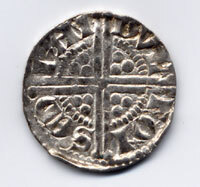 However, Stephen's coins continued in use up to 1158. Henry at first issued Cross and Crosslets coins. The Cross and Crosslets coinage was produced in 30 mints to get the coins established but once this was achieved their number was cut to 12. 1158 The Tealby coinage was introduced and minted at 31 mints. These coins are relatively common today, but are of poor quality and often difficult to read. Because 5,000 Henry II pennies were discovered at Tealby in Lincoln in 1807, this is called "Tealby" coinage. The mint at Bury St Edmunds issued all various types of "Tealby" coins, known to collectors as Classes A to F.
1180 The King had several foreign artists working at the Royal Mint. The best known is Philip Aimery of Tours, who was brought over by Henry II to oversea the redesign of the coinage from tealby to short cross. After he designed the short cross coins he was sent home in disgrace in 1181 after failing to stop fraud by his moneyers. 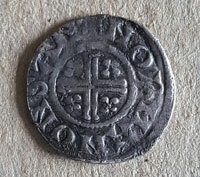 The poorly struck Tealby type was replaced by the better made short cross penny and continued to be issued as Henry II even under King Richard and King John who had no coins in their names. The 11 mints of Henry II after 1180 included only Norwich in East Anglia. Bury apparently ceased coin production. 1205 Under King John (1199-1216) the new short cross style was introduced by 16 mints, including Bury St Edmunds and Ipswich as well as Norwich. By 1205 King John knew that the quality of his currency had deteriorated to such an extent over the last 15 years that he was determined to sort it out. By this time he was paying his soldiers two shillings a day having massively increased their pay from eight pence a day. The name Henricus Rex was retained right through the reign of King John, just as it had been in King Richard's day. It was more important to have a coin of true weight and fineness that could be offered with confidence in the market place than to confuse the illiterate by new lettering. John needed five new mints for this output of new coins and Chichester, Rochester, Ipswich, Bury and Kings Lynn were chosen. After John's death in 1216, only Bury St Edmunds would carry on striking, of these five. 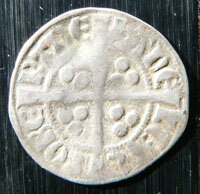 The moneyer at Bury was FULKE, but coins continued to say HENRICUS REX. 1208 King John summoned all his moneyers, together with dies, minting equipment and workmen, to Westminster, probably to verify their methods and ensure a good coinage production. We would expect that this would have included the Bury St Edmunds moneyers. 1216 Under Henry III the short cross coins continued for another 30 years, and continued as HENRICUS REX, the same as for Henry II. C. 1225 By 1225 minting was again concentrated at London and Canterbury but the Abbot of Bury St Edmunds was allowed to continue minting. 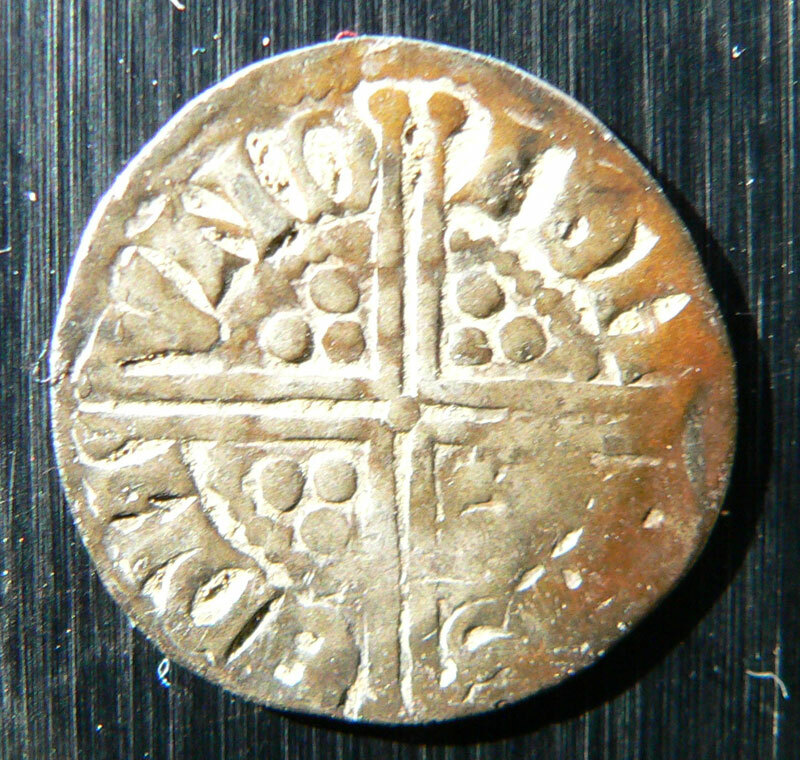 1216 From 1216 until 1247,	Henry III issued his Short Cross Coinage. 1247 The Bury Chronicle recorded that there was an alteration to the coinage of England and King Henry granted a newly cut die to St Edmund's. The new die was to be used freely with the right of exchange, just as the king himself used his dies. The new mandate was issued in December. It may be that the town had been left out of this change initially, as there is evidence that two monks, Edmund de Walpole and Thomas, went from Bury with charters to see the barons of the exchequer to prove that the abbot of St Edmund had the right to a mint and exchange. The change referred to was from the short cross coinage to the long cross, whose arms would reach to the edge of the coin. 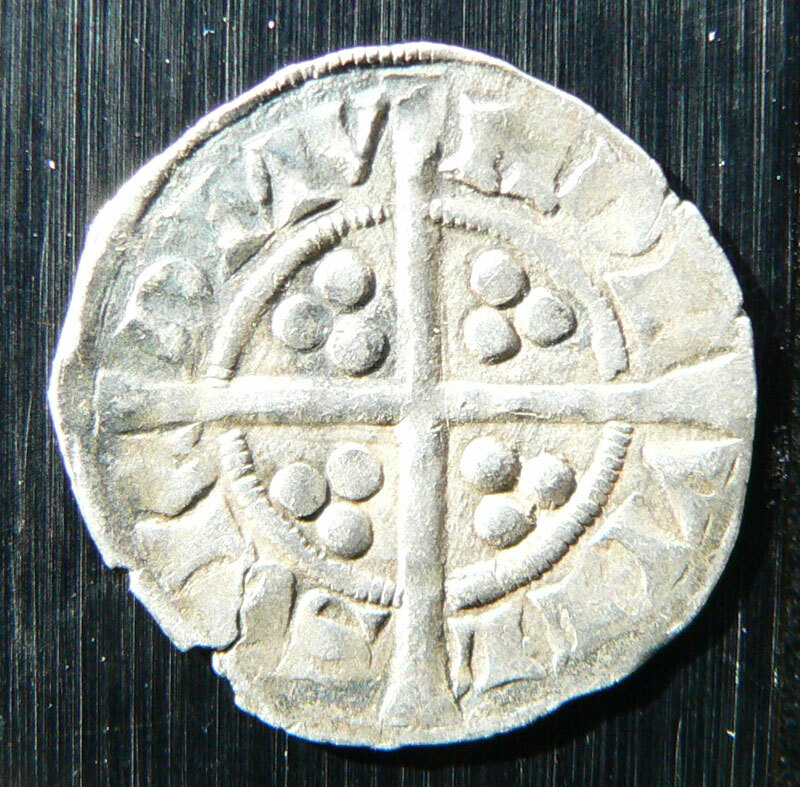 The earlier Short cross coins were certainly produced at Bury in the reign of Henry III. The aim of this new design was to deter the clipping of silver from the edge of the coinage. The coin shown here was minted at Bury by a moneyer known as John, and from its design dates to 1248. The inscription reads ION/ONS/EDM/VND, or John of St Edmunds. 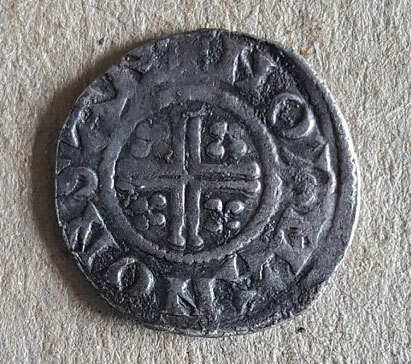 John was the name of the moneyer, no doubt licensed to make coins in Bury by the Abbot, who himself held the King's mandate to arrange for their production. The obverse shows a portrait of the King and the legend HENRICUS REX TERCI. 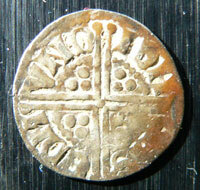 From 1247 up to 1272	Henry III issued what is called the Long Cross Coinage. Many old mints were re-opened to help produce a complete change of the coinage. Some of these coins were issued without a mint or moneyer's name but this was quickly put right. Many of the new mints opened to help with production closed again by 1250, but the royal mints of London and Canterbury and the ecclesiastical mints of Durham and Bury St Edmunds remained open. 1251 From 1251 a slightly different pattern of silver penny was produced. 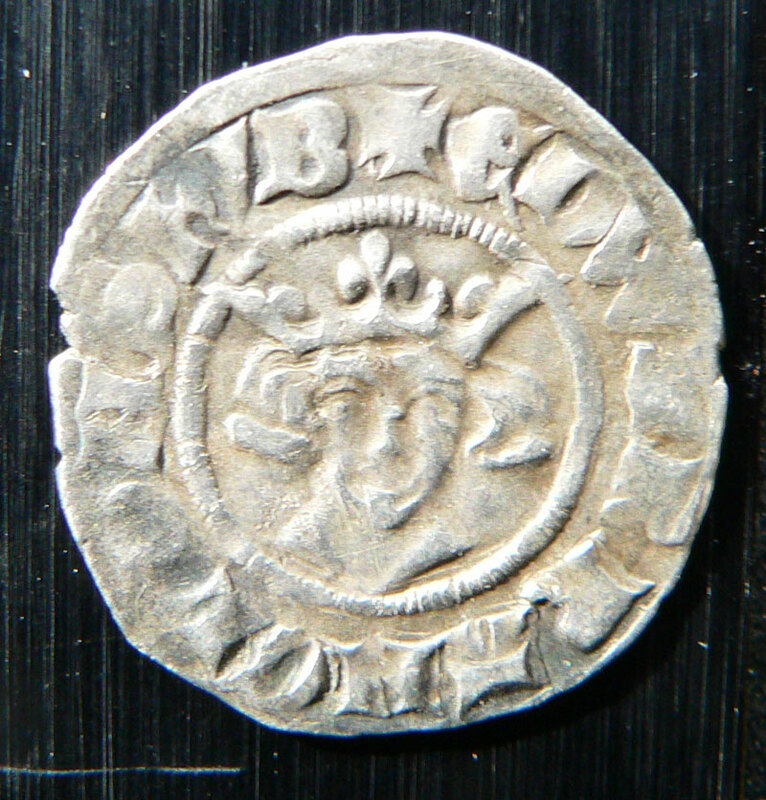 At Bury, one of the moneyers now operating was called Randulf, and the coin illustrated here was minted by him at Bury St Edmunds. No doubt he did not strike it personally, but was probably a gold or silver smith, employing a number of craftsmen in a workshop to make coins. He may well have had another workshop where articles of jewellry would be made. 1257 Henry III briefly issued a gold "penny" valued at 20 silver pence. 1272 Under Edward I (1272-1307) the earliest group of Long Cross pennies were crudely made and only lasted until 1279 but became better at the end. From 1272 until 1278,	Edward I Long Cross Coins were still issued under Henry III's name but clipping was still a problem. Only 3 mints are known to have worked at this time, being London, Durham and Bury. Strangely, the Bury coins are the commonest of the three today. 1278 The King and Queen arrived at Bury on 23rd November on route to Norwich to dedicate a church there. All the jews in England were unexpectedly seized and imprisoned. Their houses were ransacked looking for evidence of clipping the king's coinage. Soon afterwards in November all the goldsmiths and officials of the country's Mints were also put into custody and their premises searched. At Bury, despite the privilege of the Liberty, five goldsmiths and three others were marched off to London by the town bailiff. The king then allowed them to be sent back to Bury for trial, as a special favour to St Edmund. 1279 All the Jews and some Christians convicted of clipping or falsifying the coinage, were condemned to hanging. Some 267 Jews were condemned to death in London. John de Cobham and Walter de Heliun, were the justices appointed to determine pleas over money, and they were sent by the king, Edward I, to Bury to hold a court at the Guildhall. The monks regarded this as flouting in an unheard of way, the liberties of St Edmund's church. Even worse, any fines levied went to the royal Treasury, and not to the abbey convent. Because the Sacrist was in charge of the Mint at Bury, he was also fined 100 Marks, for the transgressions of the moneyers. A major new recoinage was begun in 1279 with new denominations of coins. Along with the penny came the halfpenny and the farthing and a fourpenny piece or groat was introduced. Mint administration by now was much more centralised and the practice of including the moneyer's name was largely abandoned. Edward I's Recoinage was an important improvement, and the public could take their old pennies and exchange them for the new ones. About a million new coins were struck at London and Canterbury, fewer elsewhere at the other 11 mints. 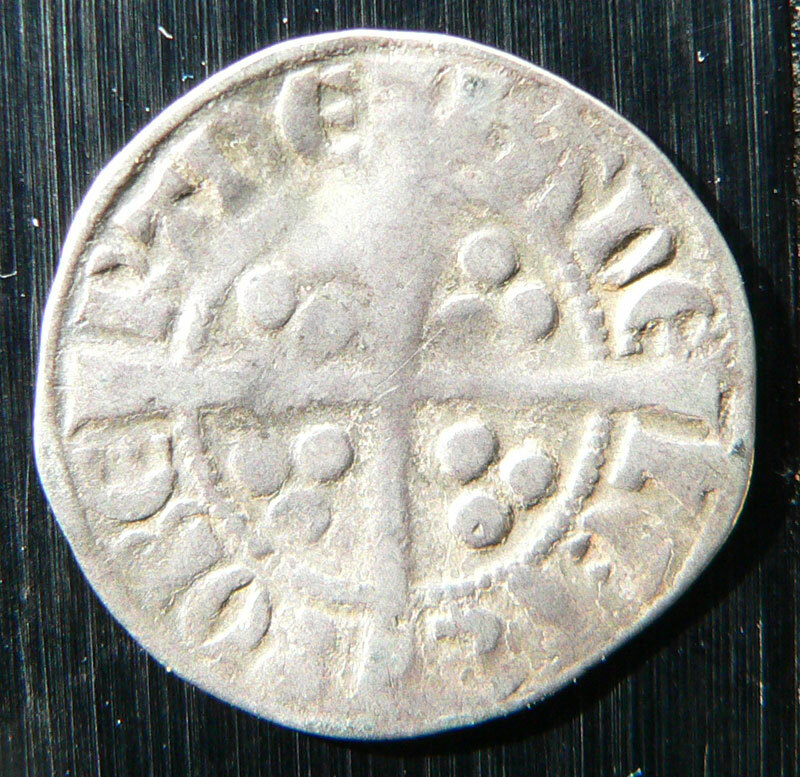 1280 In June 1280, the Bury Chronicle recorded that the new coinage began to be produced at Bury. The old coinage could no longer be used after August 15th, Assumption Day. Apparently new round halfpennies were minted. Suffolk's only mint was at Bury St Edmunds. In general these new coins gave the mint name in full and omitted the name of the moneyer for the first time since the 9th century. 1281 Since 1279 several provincial mints helped with the recoinage but in 1281 these were shut down and only London, Durham, Canterbury and Bury St Edmunds were allowed to continue. Locally, the Thetford, Cambridge, Sudbury and Ipswich mints were closed down. 1299 Additional mints opened for another subsidiary recoinage from 1299 to 1302. 1307 Under Edward II (1307-1327) the coins continued much as before. Edward II pennies are relatively easy to obtain today, although only 5 mints were in operation, at Bury, Canterbury, London, Durham and Berwick on Tweed. 1327 Edward III came to the throne and reigned until 1377. 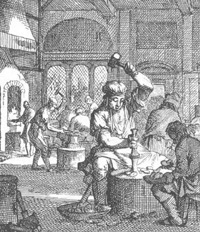 Silver pennies were still produced as before at Bury and elsewhere until 1335. 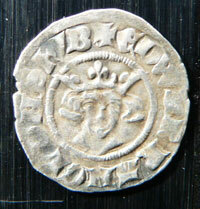 Bury coins today are extremely rare for this period, known as the first coinage of Edward III. 1335 Edward III's second coinage reduced the silver content. No further coins have been identified as minted in Bury St Edmunds. 1344 A gold coinage was introduced. The Florin or double Leopard was valued at six shillings and a half Florin was called a leopard and a quarter Florin was a helm. Within a year the Noble was introduced, valued 6s 8d. From 1344 to 1377 5 mints were in operation at London, Durham, Calais, Reading and York. To replace the moneyer's name they used marks added individually to each die. 1351 Edward III's fourth coinage was important because it introduced the groat and half groat as well as the gold noble, half noble and quarter noble. It was the beginning of the system of having a variety of denominations of money. 1363 Following the 1361 treaty with France, which gave England a cross channel trading base at Calais, a mint was opened there to make English gold and silver coins. It closed in 1411, only to reopen in 1424. It was finally closed in 1440. 1377 Richard II was crowned at the age of eleven. When England was at war with France until 1396 large quantities of good quality English silver coins were smuggled to the Continent, melted down, debased and new inferior coins illegally produced for return to England. 1489 Radical changes were made to the coinage under Henry VII (1485-1509). For the first time the pound sterling had its own coin. The pound had been a unit of account for centuries, but in 1489 a large gold pound was minted, which from the design of a king enthroned in majesty was called a sovereign. C. 1505 The shilling coin was introduced. 1535 The remaining ecclesiastical mints at Durham and York were closed by Henry VIII following the Act of Supremacy. 1535 on The national coinage was much more uniform from this period onwards and will not be dealt with here. However, there were interesting outbursts of local tokens produced to supplement the national coinage. The locally important tokens are discussed elsewhere on the Coinage Homepage.